(CNN) – Republican Sen. Scott Brown, engaged in one of the nation's closest battles for U.S. Senate against Democrat Elizabeth Warren, said Tuesday he does not condone the offensive gestures and sounds some of his staffers made at a rally this week. The Brown staffers were captured on video making "war whoops" and "tomahawk chops," an apparent reference to the controversy surrounding Warren's claim to Native American heritage during her time as a professor at Harvard Law School. Both Brown and Warren released television spots Monday on the topic. The staffers in the video were identified by CNN affiliate WCVB as deputy chief of staff Greg Casey and constituent service counsel Jack Richard. Other state Republican officials are also seen on the tape, which was taken by Democratic activists and posted to YouTube. Asked about the tape Tuesday at a press availability at Boston's South Station, Brown said he hadn't seen the footage but did not support the actions as described by reporters. "That's not something I condone. It's certainly something that if I am aware of it, I'll tell that member to never do it again," Brown said, before launching into an attack on Warren's claims to Native American heritage. "The real issue here is, and the real offense, is the fact that Professor Warren checked the box. She said that she was white, and then she checked the box saying she was Native American and then she changed her profile in the law directory once she attained her tenure," Brown said. "That's quite offensive to Native Americans." In May, Warren stirred controversy when she confirmed that she had described herself in faculty directories as having Native American heritage while teaching at Harvard Law School. She said she did so in order to meet others with similar backgrounds. Opponents quickly seized on her comments, arguing she had tried to use minority status as a way to advance her career. The Crimson, Harvard's student newspaper, printed articles in the late '90s quoting law school administrators hailing Warren's Native American heritage as evidence of faculty diversity. The New England Historic Genealogical Society provided CNN with initial research showing several members of Warren's maternal family claiming Cherokee heritage. The Native American link extends to Warren's great-great-great grandmother O.C. Sarah Smith, who is said to be described as Cherokee in an 1894 marriage license application. The genealogical society gathered that information through a 2006 family newsletter and said the original application cannot be located. Monday, Brown's campaign released a television spot compiling newscasts reporting on Warren's claims. The ad, designed to cast doubt on Warren's trustworthiness, ends with a reporter asking Warren if there is anything that will "come out about you that we don't already know." "I don't think so, but who knows," Warren responds. Warren fired back in an ad of her own, saying Brown was attacking her family. "As a kid, I never asked my mom for documentation when she talked about our Native American heritage," Warren says in the spot. "What kid would? But I knew my father's family didn't like that she was part Cherokee and part Delaware, so they had to elope." "Let me be clear. I never asked for or never got any benefit because of my heritage," she continues, addressing the central concern that Brown has brought up on the campaign trail and at the candidates' first debate last week. "The people who hired me have all said they didn't even know about it." If you have to draw on peoples' negative emotions to gain support for your ideas, that's not very enlightened. Senator Brown needs to grow up a bit. Warren makes up a heritage she doesn't have. Blames her family when she gets caught. Accuses Brown of attacking the family she blamed. Do we really need another Harry Reid in the Senate? Vote Brown. Brown, the right's foremost hottie now that we've seen Ryan is ugly inside and out, is looking very tired these days. Then FIRE THEM - put your money where your mouth is. This is absolutely dirty politics at it's finest. I don't think Scott Brown wants to be a Republican anymore. I can't blame him. Did those of you who are calling her a liar read the article??? "The New England Historic Genealogical Society provided CNN with initial research showing several members of Warren's maternal family claiming Cherokee heritage." Sounds like the Brown campaign has a maturity issue. Hey Senator, ever hear the one that goes, "You're know by the company you keep"? I new of a real light pale skin person with steel blue eye, blond hair and Indian. Maybe Ms. Warren just might who she say she is. Bless. 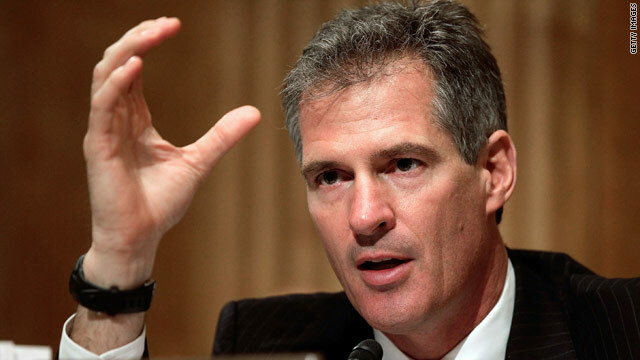 Face it...that picture is Scott Brown miming how he grabs it under the CEOs' desks.